Sanibel Island Real Estate, Captiva Island Real Estate - Sanibel Historical Village! Did you know Sanibel has a historic village and museum? Located at 950 Dunlop Road, our village has 11 cottages, homes and original island businesses to explore. This is a great way to discover our history and learn how island life progressed over the years. Before our causeway was built, Sanibel and Captiva islands were nothing like they are today. Shell roads and a sparse population made our islands pretty unique. Did you know you could order a pre-fab home through a Sears catalog? Well you could in the 20s! You can check out one of the Sears homes that was brought to the island back in 1926. The home was "The Springwoods" model and it came to the island on a barge in 30,000 pieces. The home was unique as it had a generator and indoor plumbing. Another favorite is "Miss Charlotta's Tea House," which was a small restaurant and gas station. The Tea House was located at the ferry landing on Sanibel and was the gathering place for locals and visitors to catch up on all the island news and gossip. The structure is fun to look at and it's easy to picture the Tea House full of Sanibel residents and visitors. I don't think you can have a historical village without a post office, and ours was built with lumber salvaged after a hurricane! You can look at the mismatched lumber and just imagine the community effort that went into its construction. Our "season" is in full swing and real estate is really moving! The market is definitely on the way up and this is the time to buy! In a few years people will be saying "I wish I bought back when..." and I don't want you to be one of them! Give me a CALL TODAY and I can start the search for your perfect property. 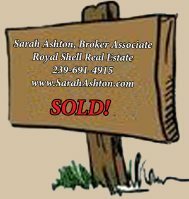 Homes, homesites or condos, I have information about every listed property on the islands! Contact me and let me know your buying criteria and I'll get to work!